American firm BFDO Architects has included a series of niches and pathways for shy cats to escape guests in its design for this Brooklyn home interior. 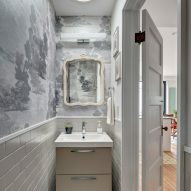 The row house, named House for Booklovers and Cats, was created for a couple who are both passionate about poetry and art, and their two cats. One is a professor and poet, the other works as director of poetry and literature at the Library of Congress. 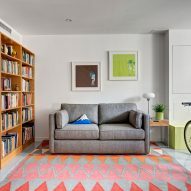 As clients, they were seeking a colorful, light-filled home. 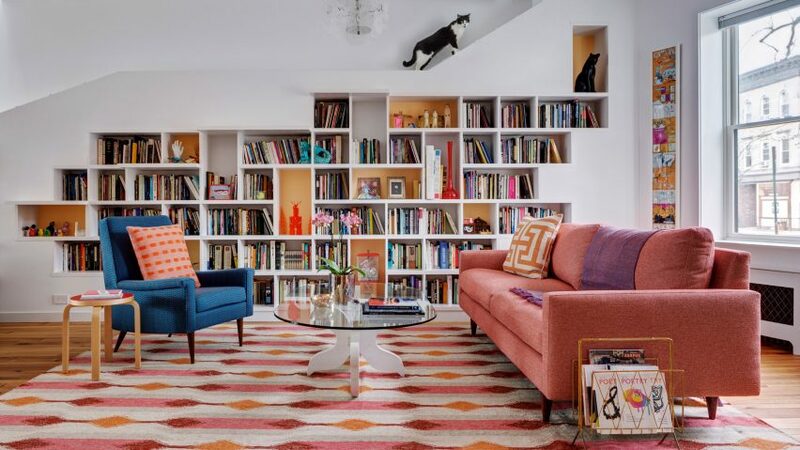 "They also wanted the house to provide accommodations for their two shy but inquisitive cats — including ways for the cats to slip away from unexpected guests," said BFDO, an abbreviation of Barker Freeman Design Office. Forming a main feature in the living room, a custom-made book shelf runs along the entire left side. It has dozens of cubby holes, and its top features two ledges that ascend from the middle, serving as a crawl-space for the felines. "Shelves project to create steps for the cats to climb up to a continuous open ledge where they can observe activities below," said the firm. At the top of each side of the bookshelf are crannies that lead up and connect to rooms on the floor above through trap doors. A central skylight casts light over the middle of the bookshelf. This isn't the first time architects have had to cater for cats. A house and studio in Tokyo, a blackened timber extension in London and a loft in Taipei have also all been designed with walkways and ledges especially for furry companions. The living room off the entryway is furnished with an upholstered blue chair and pink sofa. The firm kept some of the original features of the home, such as its pine floors, doorknobs, staircase banisters, and an antique chest found in the dining room. All of the walls in the residence are painted white, with pops of colour provided by the pink front door, a grey handrail, and furniture pieces throughout. A second couch area joins the front and back of the ground-floor plan, forming a divide between the living space and a hallway that has access to a powder room and the basement. A kitchen and dining area leads out to a garden, accessed via an industrial-style staircase. At the back of the house, a two-storey wall of glass floods the interior with light. Below grade is a glazed door and the entrance to a guest suite — or "cat free zone" — with a bedroom and workout area. 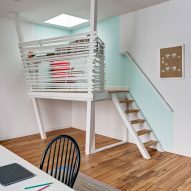 A painting and writing studio on the second floor includes an elevated space made from lumber recycled during the renovation, and a private balcony overlooking the garden. 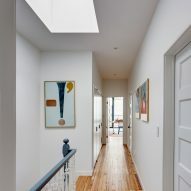 BFDO has renovated another Maple Street School in Brooklyn features warm wood interiors row house in Brooklyn with ample lighting and pops of colour, and the firm won several local awards for its Maple Street School project.